Last week, we attended our third Game Developers Conference (GDC). GDC 2015 convinced us that virtual reality (VR) was viable and will spread across several industries (see our Virtual Reality: It’s Real All Right report). GDC 2016 surpassed our expectations. The headsets are ready, so much so that VR content was the focus rather than hardware. The content is loaded across all three high-end VR gaming platforms, and release dates are imminent. VR is here. VR is going mainstream. VR is real. As a final note, some of the companies we met and trends we observed sparked déjà vu from out attendance at CES 2016 this past January, so we’ve included some of our thoughts and observations from that show too. See what we uncovered about VR at CES 2016 in January. Last week, we returned to our third Game Developers Conference (GDC) in San Francisco – my how things have changed over the past two years. In 2014, Oculus’ DK2 stole the show. This year, VR gaming was all about content. Although exhibitor attendance looked the same as last year, attendees were noticeably down (several exhibitors bemoaned this observation too). Yet, in spite of fewer people perusing the exposition floor, the Oculus and PlayStation VR booths were always busy, with queues wrapping around three sides of the booths and then doubling back. Gamers want VR. Gamers demanded new content. And gamers were prepared to wait hours in line for a taste. New tools will help programmers develop VR games faster (in some cases in VR). Since attending our first GDC in 2014, we were amazed at how the virtual reality gaming ecosystems have evolved over two short years. In 2014, Oculus stole the show by wowing gamers with futuristic 360°computer-generated worlds for gaming. Facebook (FB: NASDAQ) noticed and bought the company for ~$2 billion on March 25, 2014, sparking interest on what the social media platform had in store for virtual reality hardware. GDC 2015 saw HTC Valve Vive’s HMD as well as Sony’s Project Morpheus (now known as “PlayStation VR” or “PSVR”) prompting a battle between high-end VR gaming platforms. Virtual reality (VR) was at the forefront of industry minds before GDC’s exposition floor opened. We attended an event and chatted with tech executives, content creators, and gamers. Many attended GDC’s sessions and boot camps; almost all began their conversations with VR. ALL of them had no doubt VR was real and would prosper to the extent that several had signed up for coding sessions to refine their VR programming techniques for content creation. GDC 2016 was no longer about HMDs. Content is king, and that’s what was on the mind of industry professionals and enthusiasts. In our GDC report last year, we highlighted the need for content in order to drive adoption of HMDs. We are pleased to say that the content is finally here and has some solid momentum and includes gaming and non-gaming content. Oculus will launch with 30 games; PSVR with 20 games; and HTC Valve with over 50, as well as the ability to stream Valve’s Steam library of 2D titles over the Vive. Gamers wanted content – gamers are getting content. The Consumer Technology Association (CTA) forecasts that U.S. VR sales will reach $540 million in 2016, a 440% increase over the prior year. Unit sales could reach 1.2 million, a 500% increase. SuperData Research, a provider of gaming market intelligence, sees VR gaming generating $5.1 billion in 2016 on an installed base of 55.8 million consumers (low cost HMDs like Google Cardboard dominate). Graphics card manufacturer NVIDIA (NVDA:NASDAQ) claims that only 13 million PCs will have the ability to stream VR this year. The divergence with SuperData’s 55.8 million installed base appears due to over half of those enthusiasts are using a smartphone-based HMD. NVIDIA is only considering desktop VR, which SuperData Research estimates at 6.6 million users. Although these estimates both assume millions of units, there is still obviously some uncertainty as to just how many units will sell in 2016. Research firm CCS Insights forecasted that 2.2 million virtual reality devices would ship in 2015, rising to 20 million by 2018. By 2017, the firm expects 12 million VR devices would sell. Last year, we wrote: “Although we anticipate HMDs to hit the market this year (2015), we don’t know when developers will release commercial VR games and applications en masse.” We were correct about HMDs not released in 2015. In fact, VR enthusiasts were disappointed that HTC Vive and Oculus releases were delayed. Now, HTC and Oculus are pre-selling their platforms with Oculus Rift shipping initial units at the end of March. Vive will get into consumers’ hands starting in early April, and PlayStation VR will come in this October. Oculus got January’s CES 2016 started before the show started. Two days before the convention floors opened, Oculus founder Palmer Luckey tweeted that Rift pre-orders would commence on January 6, 2016 with shipments starting in Q1 2016 (Touch, Oculus’s handheld controller, is set to ship in the second half of 2016). VR enthusiasts were ecstatic. Pre-orders include two games: Lucky’s Tale by Playful, and CCP’s EVE: Valkyrie. We’ve played the latter on Rift, and it rocks! We experienced no motion sickness or lag on the system when Oculus demoed the game at the E3 expo last June in Los Angeles. We also tried EVE: Valkyrie in multiplayer mode at GDC (more on that later). Palmer Luckey also revealed that Oculus expects to have over 100 games and experiences for the Rift in 2016. Content is coming in a big way, and this is key for consumer VR adoption, in our view. By the time CES 2016 opened in Las Vegas, Oculus announced Rift pricing – US$599, or US$1,500 once you add a recommended computer for processing. Many VR enthusiasts were unhappy, so we conducted an unscientific, unsupported R² poll to gauge the CES floor mood and hear what people were thinking. We chatted with 20 or so people and found that the sentiment for and against $599 was evenly split. Those unhappy with $599 cited a $350 price previously floated by Oculus. Several in this camp said Oculus had become “VR for the 1%”. Those who thought $599 was reasonable said that VR hardware, software, and firmware is complex engineering and commanded a high price point – we agree. Still, the pricing didn’t deter enthusiasts and those curious about VR to line up for up to 90 minutes for an Oculus demonstration. We believe that there’s no reason why Oculus can’t win the gaming space. Sure, Facebook owns the HMD and had 1.59 billion monthly users in the fourth quarter of 2015. But what many people may not know is how many subscribers play games on Facebook. Leo Olebe, Director, Global Games Partnerships at Facebook, wrote: “33 million people have connected their Facebook accounts to either PlayStation Network or Xbox Live, while more than 450 million people play Facebook-connected games on web and mobile every month. Last year alone, game developers earned over $2B on our web gaming platform.” It seems to us that Oculus VR gaming can easily grow a subscriber base on Facebook. We bit the bullet with Oculus. After waiting in line for 75 minutes at Oculus’ GDC booth, we got to play a much hyped game called Bullet Train. We can only describe Bullet Train as INSANE! By far, this game was the best virtual reality experience we’ve ever had. 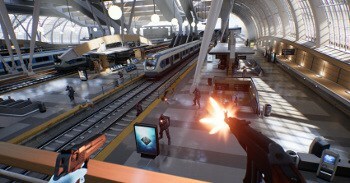 Created by Epic Games, Bullet Train involves shooting resistance forces infiltrating a subway station. Between lobbing grenades, blasting shotguns, and catching bullets and rockets to fling back at the enemy, Oculus’ graphics were pristine; the Touch controllers were light and intuitive; everything worked perfectly and gets our vote for Best in Show. After our hearts stopped racing from Bullet Train, we circled back into Oculus’ queue and waited 45 minutes to play EVE: Valkyrie, in multiplayer mode. EVE: Valkyrie, a space dogfight shooter game by CCP Games, is a VR game we’ve played solo before, but not in multiplayer mode where we fought alongside seven other players to defeat the enemy. We found the experience underwhelming. Not because of the graphics, audio, or synching (all of which were perfect), but because it didn’t feel like we were playing as a team. Still, it was fun, but having the ability to communicate and coordinate attacks with our teammates would have made a far better virtual reality experience. On February 21, 2016, HTC (2498:TPE) announced that consumer Vive edition pre-orders would commence on February 29, 2016 with delivery for April. Pricing is US$799 plus about US$1,000 for the supporting processing unit. Vive will ship with two VR experiences: Job Simulator and Fantastic Contraption. The public snapped up pre-orders. According to Shen Ye, an HTC employee, 15,000 HTC Vives sold in less than ten minutes. To support their HMDs at GDC, Valve showcased 30 games. We were perplexed why HTC and Valve (private), an entertainment and technology company that created the classic Half-Life game, weren’t on the convention floor. In fact, it wasn’t until the exposition’s second day that happenchance came from an 18-year old gamer. He directed us to a room under an escalator where Valve had set up shop for its Steam games. We wandered over to the odd location and proceeded to demo a fantasy game called Thunderbird VR. The Vive’s graphics and tracking were flawless, on par with Oculus. The Vive felt comfortable and balanced on our head. The 14.5-foot-long cable to the console was unnoticeable. We had hoped to talk to Valve representatives after the demo, but were rushed out due to the long line-up of enthusiasts waiting to try Vive. Before leaving, we did manage to chat with Thunderbird VR’s developer, who said coding for Vive is “a dream”. This was a common observation from many VR game coders we spoke with; all praised Vive for its graphics and tracking features. During GDC, Valve announced a beta SteamVR Desktop Theater Mode to allow gamers to play non-VR games in a virtual theater. Recall that Valve and HTC partnered to create the Vive HMD. To support the HMD, Valve created virtual reality content. Now to expand the value proposition of the US$799 Vive, Valve has expanded Vive’s content by offering customers the opportunity to play any Steam (Valve’s Internet-based distribution platform) game via the SteamVR Desktop Theater feature. The gamer would slip on the Vive which would transport her to a virtual location that has a virtual display to stream the gameplay. SteamVR Desktop Theater Mode isn’t limited to the Vive; any HMD that is Steam-compatible can support the feature including Oculus. One more feather in HTC’s cap. Late last year, HTC announced it was partnering with ShunWang Technology, one of China’s largest Internet café software providers. The partnership could see VR roll out to hundreds of millions of Chinese café gamers. At CES 2016, Sony (SNE:NYSE) took the stage during CES’s press day (the day before CES opened the exhibition floor) to talk about what attendees could expect from the company. Surprisingly, Sony remained tight lipped on its VR platform – PlayStation VR. That changed at GDC 2016. During GDC, Sony announced that PlayStation VR will be available by October 2016, but rumours on the show floor were that pre-sales would begin as soon as March 22. Sony set a US$399 price for the HMD and once you add a US$349 PlayStation 4 to connect the HMD and a tracking camera for US$60, you’ll have a gaming platform costing a reasonable $808. PlayStation VR could reign the virtual reality gaming kingdom when you consider that PlayStation 4 already has a 36 million unit installed base. More content is likely to come; Sony also revealed that 230 developers are working on games including major publishers Ubisoft, 2K Games, and Electronic Arts. We strolled over to the Sony booth and waited an hour to try PlayStation VR, formerly known as Project Morpheus. Slipping on the HMD made us appreciate the thought that went into its design. Unlike Oculus’ Velcro straps, PlayStation VR had elastics that allow one to easily and comfortably affix the HMD to your head. A dial at the back tightened the elastics, and a button at the front adjusted the fit on our face (very elegant indeed). Then, we had a chance to interact with the motion controllers. We cycled through five virtual orbs, each constructed from a different material. We could bounce the orbs off our head, slap them around with our hands, and even stick our face into a watery orb and exhale bubbles (we can’t figure out how Sony does that!). We had five games to select from, and we returned to London Heist, a title we’ve played before. Unfortunately, the gameplay wasn’t smooth; for some reason, the gun would randomly drop, requiring us to search the van while thugs on motorcycles fired bullets at us. If you have never experienced VR, London Heist gives you a great overview of the emotional intensity that VR imparts. PlayStation VR’s Into the Deep. Our second pass at PlayStation VR was more incredible than London Heist. Into the Deep placed us into a diving cage that descended to the depths of the ocean. There was nothing to do but look around at jellyfish, manta rays, and shipwrecks. Without ruining the ending, we were attacked by a great white shark – a frightening experience that left us eager to ascend to the surface. Samsung’s Gear VR, which uses Oculus technology, had demonstrations at the Oculus booth. In fact, numerous companies used Gear VR at their booths to stream content and games. We tried several Gear VRs, and if you’ve never experienced VR, you would be awed. However, if you’ve played games on Gear VR after trying an Oculus, PSVR, or Vive, you may shrug your shoulders and walk away. Gear VR uses a Samsung smartphone’s screen and processor, and there is no way a smartphone processor can compete with console gaming video card. Even 360° video on Gear VR was somewhat disappointing since the smartphone screen’s pixels are noticeable. We’re not suggesting that Gear VR isn’t a great product. It’s just that for us, we want to use it for VR gaming. And if VR gaming is what you want, a tethered HMD connected to a dedicated video graphics card is what you want. While Gear VR is doing an amazing job of getting VR into the hands of the masses, we think that much the same way consumers have upgraded TV’s from SD to HD and now to 4K (and at CES 8K), VR enthusiasts will demand the same high quality. We’re often asked when we think high-end gaming HMDs will lose the tethered cable and go wireless. We’re not wireless or high-speed data engineers, however, we do like to chat with people who work on VR game code and video hardware. Let’s start with what we found out at GDC. Keep in mind, that GDC appeals to the game coder community, and these engineers may not have a lot of physical hardware design experience. Virtually everyone we spoke with last week said that wireless is the way the industry would evolve. And when we asked when that might happen, several said it is years away not months. We chatted with hardware engineering recruiters at GDC. One woman, who works at a leading graphics card company, said she was not hiring wireless engineers for their VR group. That did not mean that her company may not have research and development projects underway, but she specifically wasn’t recruiting for wireless VR. She did ask if we knew any killer coders and printed circuit board designers if you happen to be looking for a new role. From there, we chatted with a recruiter from one of the three, high-end tethered HMD vendors. Were they seeking wireless hardware engineers? The answer was “no”. In fact, they weren’t recruiting any hardware engineers, suggesting this OEM is secure in the platform. What does an Intel (INTC:NASDAQ) rep, whom we met at CES, 2016, think? According to this Intel rep, high-end HMDs won’t go wireless any time soon. He said that the amount of processing is astronomical: data, video, sensor transmit and receive, audio, movement, etc. This amount of processing also requires power – a lot of it, so for high-end VR, removing HMD cabling isn’t likely to happen. An AMD (AMD:NASDAQ) rep whom we met at a VR conference late last year also mirrored what we heard from our friend from Intel. He chuckled when we asked how long it would take to get the processing and graphics quality of a PC/console driven VR HMD into a “phone driven” HMD (like the GearVR). His comment: “I don’t know – ten years? Before VR we thought the graphics war was over and we had done everything we could, but now we are back in full development mode and doing things that can require multiple cards in a system to produce an even more immersive experience.” He continued: “I believe the first step is to ensure that the best experience is achieved on wired solutions and set that as a standard. Once that’s set, the other wireless options will be explored. Latency is a very important metric and to ensure that’s as low as possible, wired solutions work the best right now.” We expect the quality of graphics to continue to accelerate over the next several years and for the highest-end HMDs to remain tethered. One more data point from a veteran, high-speed chip designer who follows VR closely. He said that the amount of processing and battery power makes it prohibitive to make a high-end gaming HMD wireless. He added that it would take 10 “quiet” Wi-Fi channels to push data into a wireless headset in order to avoid high-end gaming distortion. And as soon as someone opens a door and changes the room’s signal propagation characteristics, things could happen to the video stream. Perhaps he was doing back of the envelope calculations, but we’d tend to believe him rather than armchair hardware engineers like ourselves. Consumers want HMDs. Oculus, HTC, and Sony have all communicated that gaming is a target market for their HMDs. However, not everyone will want to use their HMDs for high-end games, meaning that they won’t need the Oculus, HTC, and Sony platforms. There are several other HMDs that will excel for applications that include: education, real estate, 3D video streaming, and journalism. With the exception of Google (GOOG:NASDAQ) Cardboard, Samsung’s (005935:KRX) GearVR (priced at $99.99), Razer’s (private) OSVR, the Freefly HMD, and Vuzix (VUZI:NASDAQ) few HMDs are available now. In Sophic Capital’s E3 VR gaming report, we highlighted Vuzix Corporation as an OEM to watch. It seemed CES 2016 agrees; CES 2016 awarded Vuzix with eight International CES Innovation 2016 awards, including a Best of Innovation Awards Honoree for the iWear Wireless Video Headphones in the Gaming and Virtual Reality category. Vuzix showcased its iWear Video Headphones at CES. iWear is a pair of high-end video headphones, providing users with a mobile wearable video display and gaming solution featuring dual high-definition displays. It supports HDMI inputs, so users can hook up to their existing 3D Blu-ray player, tablet, console system, PC, and even mobile phones. iWear also includes an integrated tracker that takes the system to the next level of immersion by tracking head orientation and movement for “see where you look” head tracking. At CES, Vuzix demonstrated the 360° images and videos taken by RICOH’s THETA S camera (more later). In our report Virtual Reality: The Industry Forges Ahead we highlighted Apple’s (AAPL: NASDAQ) career posting for a “VR/AR Programmer” with experience developing VR/AR platforms. Rumours abound about Apple’s VR/AR involvement and secret development teams. Although Apple hasn’t confirmed the rumours, evidence suggests something is going on in Cupertino, California. The Company has made acquisitions in the VR/AR space: AR firm Metaio in May 2015; motion capture company Faceshift in November 2015; Emotient, a company specializing in facial expression detection, became part of Apple in January 2016; and Flyby Media, which helps mobile devices scan and identify real-world objects, was also acquired in January. In a Wall Street Journal online article published February 2, 2016, Jeremy Bailenson, director of Stanford University’s Virtual Human Interaction Lab, stated that Apple had visited his lab three times in the past three months. This in itself isn’t unusual until we add that Professor Bailenson noted that Apple had not visited his lab in the past 13 years. Over the past year, we’ve read rumours about Nintendo (7974: TYO) stepping into VR. Although Nintendo was present at GDC 2015 and E3, it didn’t have any VR offerings. Now the company appears to have changed and “are looking” at VR with no details provided. We believe this could be a response to Sony’s PlayStation VR. Nintendo may release a new console this year. It wouldn’t be Nintendo’s first foray into virtual reality; in 1995, the company released Virtual Boy, a 32-bit 3D game console. Consumers balked at the ~US$180 price, and despite price decreases, Nintendo discontinued the Virtual Boy platform less than a year later due to poor sales. Last year, we highlighted Japan’s Miraisens, a 3D haptics firm that recreated the sense of touch in several dimensions by means of vibration. Miraisens was tiny and hidden in a dark, lonely corner of the Moscone Center. What a difference a year makes. This year, Miraisens had a huge booth with several interactive 3D haptic stations. The technology is better than ever and should be commercialized later this year. We demoed a space shooter game, flying a spacecraft while dodging lasers. We could feel the g-forces on our yoke while dodging enemy laser fire. On March 9, 2016, Intel acquired Relay Technologies, an Israeli sports imaging company, for $175 million. The companies have collaborated since 2013 to optimize Relay’s rendering engine on Intel’s platform. Relay’s technology utilizes twenty-eight 4K cameras in arenas in order view sports events from numerous angles. This isn’t Intel’s first foray into VR. Intel was the co-lead on a $9.37 million Series A round for Avegant. Glyph (see below) is Avegant’s flagship HMD. An array of 2 million micro mirrors reflect the light from a low-powered light-emitting diode onto the retinas, which mimics how our eyes receives light reflected from real objects. There’s no need for a screen or external mobile device. Intel also has its RealSense technology, which enables device control with a wave of the hand, a head nod, and even a wink. In essence, a person becomes the input device for a computing device. Needless to say, this should foster a community of VR and AR development. Games could be developed for the platform, or perhaps a word processor won’t require a keyboard as a person types in mid-air. Amazon (AMZN:NASDAQ) appears to be exploring VR. Careers website Glassdoor shows Amazon advertising for a Senior Software Development Manager for Virtual Reality. Why? The career posting states: “The Virtual Reality team will explore and create the platform and interface for immersive storytelling.” Are virtual reality books coming? Maybe virtual reality streaming video? We don’t know but will watch this develop. Located in the heart of Amsterdam, The VR Cinema started as a European tour. For €12.50, consumers can experience 35 minutes of VR film. Madrid, Berlin, Paris, and London are planned future locations for expansion. VRV Prod (private) appears to be targeting Google Cardboard with the POCKEYES handheld teleporter. The company claims POCKEYES creates an immersive 360° experience in 5 seconds anywhere. This cardboard HMD is collapsible, equipped with special lenses, a smartphone, programs. ANTVR (private) has a solution that moves VR from being a fixed interaction (turn your head while seated and use a gamepad) to a mobile experience, where you can run, jump, crouch, and walk. The headset features a 100° field of view. TAW is a foldaway VR headset for the smartphone; ANTVR camera shoots 3D content for VR. Royole (private) is unique in that it offers a foldable audio/video HMD called Royole-X that comes with a 3,300 pixel per inch display. Users can enjoy cinematic movies by streaming content from Netflix, Amazon Video, YouTube or play immersive games from nearly any platform (i.e. : Xbox, Wii, PlayStation, Android and iOS). Shenzhen-based IHUAQI Technology is focused on VR headsets. In addition to offering Google-Cardboard-like HMDs (several vendors at CES were monetizing the design) IHUAQI has what it calls its VR Headset. ViuLux VR (private) has a prototype that should be commercialized by March. The product may be priced at US$350, but the platform is only available in China. Interestingly, they mentioned that they supply most of their HMD components, including the tethering cable, from the same supplier as a major HMD OEM when we enquired about component procurement. The ViuLux rep stated that the cable manufacturer consolidates orders so it didn’t matter if ViuLux wanted a few hundred or thousands. Dongguan Long Optoelectronics showed us an HMD named “HMD”, which had an integrated screen, 100° diagonal field of view, and an HDMI port to interface with a PC or game console. They also had a GearVR-like HMD called “3D Virtual Reality Headset” that uses an external phone and is priced at a whopping US$30. We rode a virtual roller coaster on the former device and streamed content on the latter. We wouldn’t rate these devices as having Oculus quality; not even GearVR quality. But they were okay, especially at these price points and will help to get VR experiences into the hands of the masses. Homido, a Chinese/French VR consortium, has an HMD that will retail for US$79. Their HMD requires a smartphone to display content, and 300 apps are currently compatible with the platform. We tried their HMD; the content quality was quite good, but nowhere near Oculus Rift or GearVR experiences. We’re not sure about the potential of France’s Scale-1 Portal to succeed in the VR space, but we will give them credit for providing an innovative VR platform. Their “VR” platform is called SCALee, and what differentiates it is that it projects 3D content onto a wall. This means that the user doesn’t need a complicated, costly VR HMD – 3D glasses suffice. Plus, users get a Windows-based box that they can use as a regular computer. What concerns us is that Scale-1 Portal requires app developers to come aboard to create content. We think this will be difficult, especially when market forecasts call for millions of VR enthusiasts getting their hands on HMDs. Although every VR fan raves about the technology’s 3D graphic capabilities, few used to talk about 3D audio. Until now. Speaking with game (VR and 2D) coders, many are paying attention to audio’s importance. Having 3D audio that mimics the real world is what virtual reality experiences are supposed to do. Some coders claim that 3D audio is not important, since humans are visual creatures, 3D audio is not marketable (it’s all about graphics ya know), and its near impossible to allocate precious CPU time to processing something unimportant like audio. On the other side of the debate, some coders are making the effort to make audio realistic. One game coder told us how his company conducted tests on gamers. Both groups had the same video content, but one group had inferior audio. Not surprisingly, gamers with poor audio rated the experience as poor. Thus, the company was focused on improving audio in its game properties. We think that 3D audio is important and will gain more attention over the next year or two. At CES and VR meetings we’ve attended in Toronto, cinematographers have voiced how inadequate stereo (2D) audio is in VR. We met a company that may have solved this problem (there may have been more, but it’s impossible to see all of CES over 4 days). Tucked away in the Sands Convention Center, VisiSonics offers its RealSpace™ Audio Panoramic Camera to capture, measure, analyze, and reproduce full dimensional sound. We demoed the product and came away impressed; it wasn’t perfect, but it was far better than what HMD and 360° camera OEMs are currently using. The technology can integrate with any VR platform, and executives mentioned that it could be integrated into a 360° camera within a year. At GDC, we met Ossio, another firm with advanced 3D audio capabilities. We started Ossio’s demonstration in pure audio mode using a Vive. They played Pink Floyd’s Money. The sound was so crisp as we turned our head that we could pinpoint where all of the instruments should have been. Afterwards, Ossio immersed us into a hobbit house where we could hear critters creaking and snaking around. A zombie suddenly scared us – its roar making our chest tight and our eyes wide. But the demo was about sound – not video – and Ossio’s 3D sound was perfect. Spectra 7 Microsystems (SEV:TSX, SPVNF:OTCQX) designs ultra-thin interconnects for the virtual reality market. Spectra7 is not a virtual reality headset manufacturer but instead provides chips that reduce the weight and thickness of cables used on VR headsets. The Company’s chips accomplish this without sacrificing the high speed video, data and audio quality required for the best user experience. Spectra7’s VR7100 DisplayDirect™ specifically targets virtual reality headset cabling by condensing four bulky cables (HDMI, USB, audio, and power) into a single, ultra-thin virtual reality cable. On March 15, 2016, Spectra7 announced DreamWeVR™, an extensive product line targeted at next generation Ultra-HD and 5K resolution VR and augmented reality (AR) platforms. DreamWeVR™, includes four new chips, new VR-specific connectors and three new HMD interconnect configurations to support high-bandwidth, low-latency VR HMDs and AR glasses. When used together, these products deliver a more realistic, immersive, comfortable and exciting VR experience for consumers. Spectra7 is also announced its new MicroChroma™ VR/AR connectors, which are designed specifically for the VR/AR market. Existing generic connectors do not meet the precise needs of this new application space due to limited pin count, limited power delivery, and bulky size. As many as four discreet connectors would be required to deliver what Spectra7’s MicroChroma™ connector provides in a single, latching consumer connector for next-generation HMDs. VR is real. Its popularity was borne by its physical presence and abundance of content at GDC, and for the first two days at CES, it was the most hash tagged word. Mind you, VR’s popularity at CES was driven by Oculus’ announcements concerning pre-orders, Q1 shipping, and $599 pricing. VR was everywhere at GDC and CES. Consumers will have high-end HMDs in their hands this year, and VR content will continue to expand. VR is real, alright, and asking if it will influence gaming is like asking if the wheel will influence transportation.